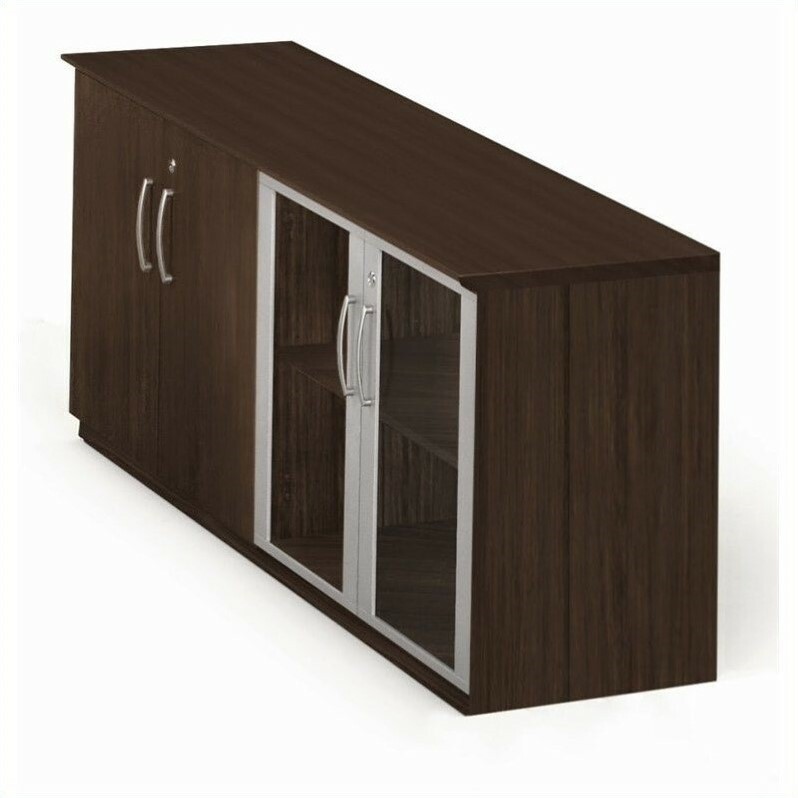 Safco Medina Low Wall Cabinet with Doors (Wood-Glass Door Combination) in Mocha. Contemporary style, elegant functionality and exceptional value come together in the Medina Series of laminate case goods. Clean lines, curved shapes and floating work surfaces reflect Italian design influences. A smartly edited array of components allows a tremendous range of workplace configurations. And all of this is delivered at an incredibly affordable price. Mayline Group is a trusted supplier of high-quality contemporary office furniture. Whether you have a small or large office space, Mayline offers the perfect solutions for your unique needs. Choose from a variety of pieces such as modular office configurations and computer desks in a variety of modern styles and finishes, which will be perfect for your executive office, boardroom or reception area. Whether you need an office desk or an executive desk, Mayline has attractive and functional options to suit your needs. Corner, U-shape or L-shape modular desk configurations modular desk configurations are available to help you make the most of your larger office spaces, while smaller options such as mobile desks and workstations work well in open-concept office spaces. Mayline is known as market leader in sit-to-stand workstations and offer several models using their VariTask height technology. Mayline also offers a full array of conference tables, reception desks and workbenches. Mayline Group is well known for their high quality office chairs. Their ergonomic features which include memory foam, high back or performance curved support offer supreme comfort. Whether you are looking for reception room chairs or a leather executive chair, Mayline has a number of options in a variety of styles to choose from. Short on space? Find additional space in your existing office by choosing office storage solutions that suit your needs. Mayline offers everything you need to fully equip your office from filing cabinets and storage cabinets to hutches and flat files. Mayline Group started out as an engineering supply company and they are especially well known today for their flat file storage and office filing storage solutions.